The Washtenaw County Board of Commissioners will shrink from 11 to 9 members under a redistricting plan approved by the county's five-member Apportionment Commission. The vote came unanimously tonight to redraw the boundary lines, reducing the number of districts in Ann Arbor from four to three, and elsewhere in the county from seven to six. The nine-district plan was proposed by County Prosecutor Brian Mackie, a Democrat and one of the five members of the Apportionment Commission. Mark Boonstra, the lone GOP representative on the Apportionment Commission and chairman of the Washtenaw County Republican Committee, raised concerns at the start of the meeting that Democrats were trying to flex their political muscle in the redistricting process to favor Democratic incumbents. But Mackie and others contested those allegations, which mostly had to do with a 12-district plan being proposed by County Clerk Larry Kestenbaum. 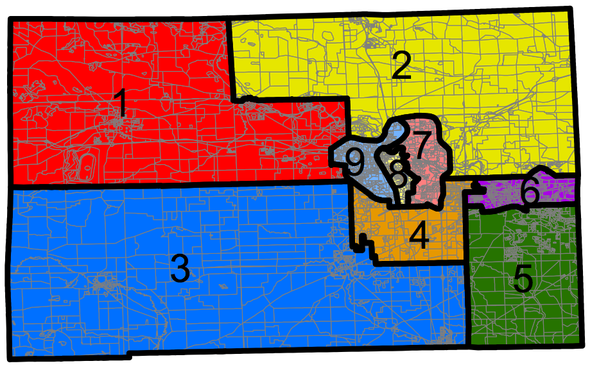 The new district boundaries will take effect for the 2012 August primary and November general election when all members of the county board are up for re-election. So far, only Commissioner Barbara Levin Bergman, D-Ann Arbor, has said she isn't running again, leaving open a newly drawn District 7 on Ann Arbor's east side. The approved plan puts two current Ann Arbor commissioners — Democrats Leah Gunn and Yousef Rabhi — in the same district (a newly drawn District 8 in the middle of the city). That means they'd have to compete against each other in next year's primary election to stay on the board, or one of them would have to voluntarily step down at the end of next year. Rabhi, a recent University of Michigan graduate who was elected to his first term in November and took office in January, said at tonight's meeting he definitely intends to run again. Mackie acknowledged the nine-district plan could mean the end of Commissioner Wesley Prater's service on the county board, as it places him in a heavily Republican district on the southwest side of the county with incumbent Commissioner Alicia Ping, R-Saline. "This hurts my favorite commissioner," Mackie said, acknowledging he and Prater, D-York Township, have known each other since the late 1970s. About a dozen members of the public attended the meeting, including Prater, who spoke and said he considered the 12-district plan "by far the best plan." Eleven different maps hanging on the walls of the meeting room were considered by the commission. The smallest had five districts, while the largest had 21. The decision to go with Mackie's nine-district plan came during three rounds of voting in which the Apportionment Commission first started by voting 3-2 against a 12-district plan proposed by Kestenbaum, a Democrat and also a member of the commission. Kestenbaum was only able to muster support for his plan from fellow commission member Cleveland Chandler, chairman of the Washtenaw County Democratic Party. In the second vote, the Apportionment Commission voted 4-1 to defeat an alternative nine-district plan proposed by Boonstra. Boonstra offered up a history of attempts by Kestenbaum and other Democrats to push through a 12-district plan. Boonstra said he was willing to support a 12-district plan, but the one originally proposed unnecessarily split certain geographic areas of the county and made one particular district — the one held by Dan Smith, R-Northfield Township — likely to be more Democratic. "And it just so happened to be the very district where a Republican defeated a Democratic incumbent in the last election," Boonstra said, referencing the fact that Smith unseated Democratic incumbent Ken Schwartz last November. "Whether by intent or by effect, that struck me as drawing district lines to effect a partisan advantage — that is, for the Democrats to gain back the district that the voters took away from them last year at the polls," Boonstra said. "To me, that was not right." Boonstra said a later revised 12-district plan championed by Kestenbaum still split precincts in York Township "for no reason other than to shore up that district for a particular Democratic incumbent" and "to keep him within that district just barely, and to also more likely make that seat unwinnable for the Republicans for the next 10 years." Boonstra said the 12-district plan was a blatant attempt to limit Republican representation on the county board to a maximum of three seats for the next decade. He claimed the lines were drawn so each of the 11 current commissioners — eight of whom are Democrats — could stay in office, even though three of them live "within a stone's throw of each other." Kestenbaum said he didn't think Boonstra's concerns were justified. "I was attempting to make a plan that would be broadly acceptable to both parties, and it was never my intention to make a district so overwhelmingly 'this or that' for any purpose," he said. Kestenbaum said those who engage in gerrymandering often find it doesn't work out they way they hope anyway, because the voters are unpredictable. In response to Boonstra's allegations, Mackie referenced his own nine-district plan that hurts Prater, a Democrat. "There's nothing partisan about it," Mackie said. Boonstra said it's his understanding certain Democratic county commissioners were upset with him for not going along with the revised 12-district plan and threatened to "turn up the heat." He believes that happened on Monday when a new five-district plan was circulated that would have cost the GOP some seats. "In my opinion, it would never pass muster in any court," Boonstra said. "It was sent as a message to me that I had better play ball with the interested Democrats, or risk losing Republicans on the county commission. That's improper." Boonstra cautioned before tonight's vote that pushing through a plan that favors one political party would result in litigation and a lot of taxpayer money spent on attorney fees. In the end, he joined the four Democrats in approving Mackie's nine-district plan. Redistricting is done every 10 years as new population data is available from the census. Under the last redistricting plan, the county board was reduced from 15 to 11 seats. Washtenaw County's population grew by about 22,000 in the 2010 census counts, which put the total population at 344,791 residents. That means there will be a fewer number of elected commissioners to represent a larger number of residents starting in January 2013. Ryan J. Stanton covers government and politics for AnnArbor.com. Reach him at [email protected] or 734-623-2529. You also can follow him on Twitter or subscribe to AnnArbor.com's e-mail newsletters.